Have you ever gone to the sink to wash your hands and picked up a wet, slimy bar of soap? It just feels disgusting! Personally, I cannot stand the feel of wet, slimy soap. Sometimes, I have wondered if there are clothes pins large enough for bars of soap. 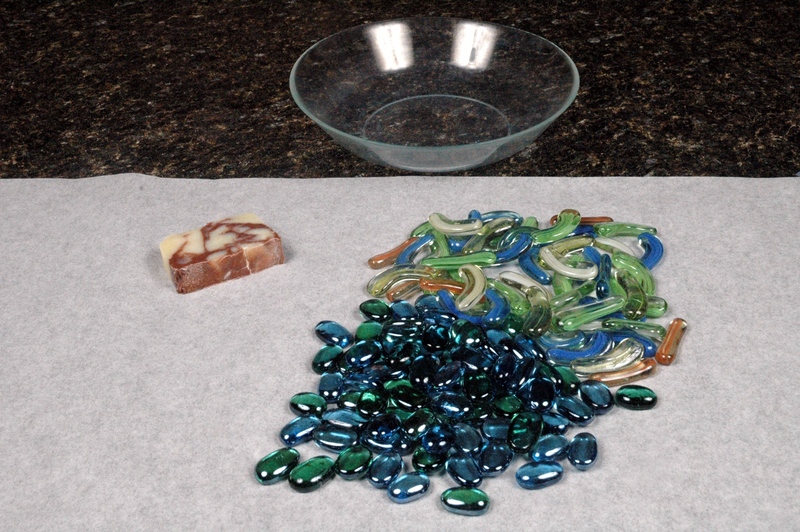 One way to prevent slimy soap is to take a small bowl and fill it with rocks or marbles. Then place the bowl by the sink and put your soap on top. 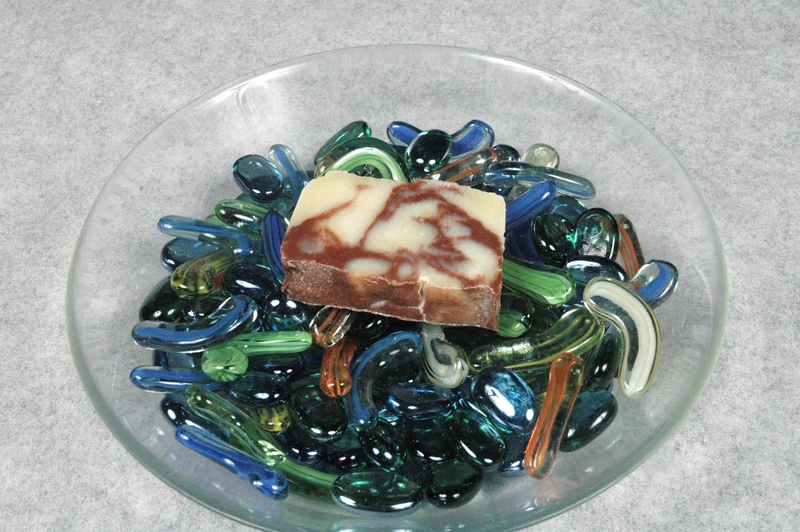 This method allows the soap to dry and it is a fun way to present your soap. If you do not want to use rocks or marbles you can use dominoes, shells, or even long pine needles. I don’t even remember who gave me this idea, so I really don’t know who to credit. However, I can say it has saved me from my paranoia several times. I love it. Yippee! No more slimy soap. What kinds of things do you use in your soap bowl to allow good drainage? Send photos please. 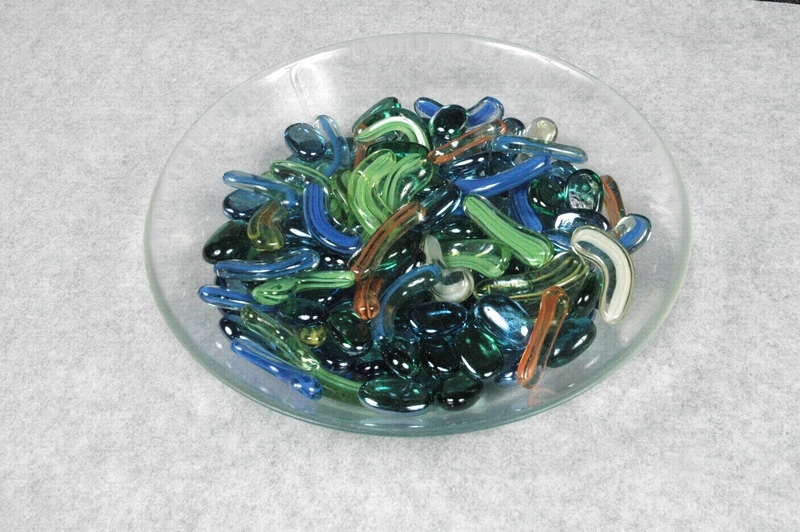 The bowl filled with glass shapes. The bowl, glass shapes, and soap. Soap on top of glass shapes. Great idea and it looks so pretty. I have a hair salon who buys my soaps and suggested I bring in a soap dish with some sample soaps, this will be perfect! At home, I cut a round 1″ thick slice of luffa and put that in the soap dish. It does get a little slimy after awhile, but just rinse and let dry. We have three soap bowls at home. One has marbles, another has river rocks, and the third has polished glass chunks. I’m hoping that I can collect enough shells on my various trips to make a “World Traveled Shells” soap bowl. When any of our bowls get slimy, I put the marbles, rocks or glass chunks in a colander that had a lid and I run them through the dishwasher on the top rack. It cleans them and I only have to do the dishes! My favorite way to find soap bowls is to go shopping at the ceramic guild sales up at the university. Most of the time I can find dishes that aren’t very expensive and can suit my tastes. My favorite bowl at home is the bowl with river rocks, because the bowl has a brown and tan glazing and with brown river rocks, it is just beautiful! I hadn’t thought about using a luffa, but it sounds like it works well. I’d love to see a picture of your soap dish! ← Road Trip Photo Opportunity!